To any regular person passing by on their way in to Eastbourne, Sovereign Harbour would resemble any typical retail park. It rose up in the nineties, each and every white-coated beam and pole slotted into place outside of big brand stores so gargantuan you can kid yourself you are in America with their village-sized Walmarts. Sovereign Harbour, with the adjoining Marina that only really looks appealing when it is the middle of summer, is often overlooked because it is so typical. Given the choice between visiting Eastbourne, with its pebbled beaches and rickety half-charred pier, I know what any person – man or tourist – would pick. While Eastbourne often tempts me with its HMV, Waterstones and Superdrug, I will often find myself asking my mum to drop me off at the Sovereign Harbour because, well, the place is eternal. I mean it in the truest sense; I have only ever seen one shop shut down and change. Walking under the flaky white arches in front of the shops lining the car park can instantly take me back to a time when I was a lot shorter and a lot cuter. Sovereign Harbour is a time capsule without meaning to be one. However, on this occasion I was not at Sovereign Harbour just to take a trip through time; an old school friend and I wanted to go watch the latest Ghostbusters film at the cinema, and as the Harbour’s Cineworld is one of the nearest and cheapest cinemas to me, it provided an excellent excuse for me to go there and write up a post on it. 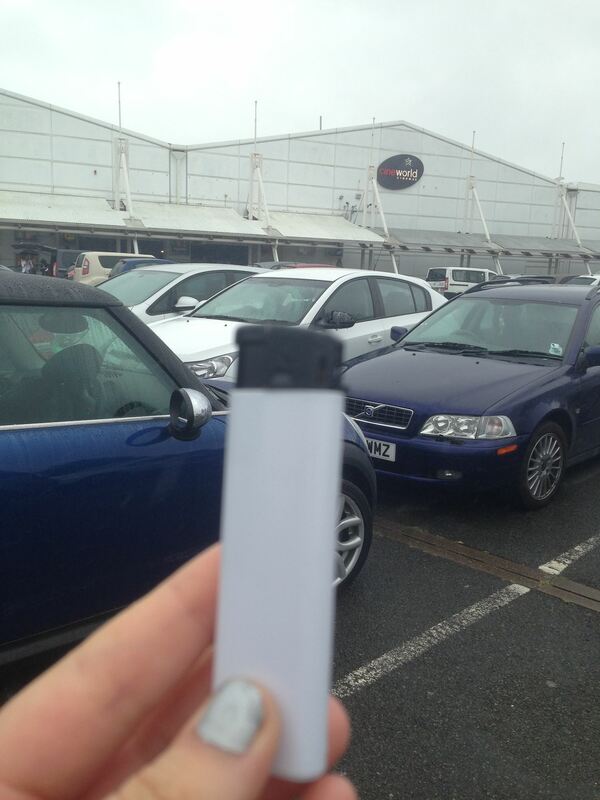 I purchased my lighter before I arrived at the retail park, deciding on plain white (not a Clipper lighter, I do not want to flirt with death) because, well, ghosts are typically that colour. Upon arriving, we ate lunch at Frankie & Benny’s for old time’s sake. Sitting in there, having my Purple Rain cocktail, I recalled a time when we had gone to watch one of the Harry Potter films and, because there were about sixteen of us, we had several tables pushed together. I cringe when I remember how we had dithered over splitting the bill; growing up, I now have a lot more sympathy for those waiters and waitresses who had the task of dealing with us. We were absolute lunatics. Before heading to the cinema, we wandered around the shops. I was not in the mind to purchase, only wanting to pop into the shops and hark back to the days where my mum would have to drag me around by the arm as I threw a tantrum about my aching feet. Speaking of feet, Brantano is still there, and the carpet is still that same faded blue eyesore. In my childhood I had spent many an hour in that shop, forced to try on various school shoes. Now, as I trod around under the curious eye of shop assistants, I felt like I might bump into myself from many years back. My sister and I, when we were bored, used to gallivant around the shop and hide behind the shelves…. though sometimes, my sister would give up without telling me and I would often leave my hiding place sobbing from fear. The Matalan is another forever-shop, but it has gone through a few changes. Before the hard faux-wood floors it was cream-coloured (lightly stained) carpeting and instead of the cheap plastic partition wall in the middle, halving the shop into clothes and home items, it was a long stretch of mirrors as far as the eye could see. There were many occasions when tiny little me would get lost, smothered by all the clothes, screeching for my mum until I eventually ended up banging into one of the mirrors, fooled by its promise of more areas to explore. After that, we went and watched the film. I won’t spoil it, even as it comes to the end of its theatrical run, but it is one of my favourite films of recent. That is all I will say on that. My friend wanted to go to the waterfront, so we trekked down just as it started to rain. I have only ever been down to the harbour in the blazing summer heat, so it was strange and eerie to see it practically deserted. I was sad to notice that the Jungle Café – a place where the decor was on point – was gone, with the wooden giraffe in the middle of the café probably firewood by now. While the world changes around me, I feel comforted that there will always be one constant, familiar place for me to return to; Eastbourne’s Sovereign Harbour. If you’re going to Sovereign Harbour and fancy some pizza, I recommend Simply Italian down on the waterfront. Saves a trip to pizza Hut and there nicer and cheaper too!